Much in the style of Jamie McGuire's Red Hill this is a Zombie/Dystopian book that stands out from the rest for the fact that is like any others I have read yet :) It's more suspense then horror, and the emphasis on emotional drama actually overrides the whole 'walking-dead' aspect. 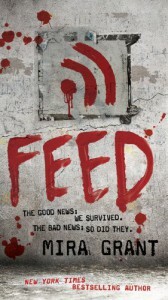 Feed is about people trying to love their lives after the world as they knew it has ended. Though there are many survivors from pre break-out, there are many post, and this is where our protagonists hail from. They are a team of young bloggers questing for status, and when they land the dream blogger job-following around a candidate for the President of the U.S.A, they pack up and join a caravan-following the senator from one town to the next as he campaigns. While they are doing this, they are trying to report honestly, stay alive not only from the Zombies they encounter, but the live virus living inside all of them which can erupt at any given time. Thus, their lives revolve around travel, important functions and tedious blood-testing rituals for securities' sake AND drama when both the truth and security fail them time and time again. Feed starts out a few decades after the apocalypse has happened but unlike other dystopian books I've read, there is no mystery regarding what had gone down which I find very refreshing. I get frustrated when there's a 'disconnect' between the old world and the new but this is written in a way that keeps both worlds within a singular, though distant focus. And it's believable. I always thought that the Zombie genre as a whole Od'd on the part where they wipe us out completely. In Feed-there's quite a lot of hope. Survivors are scattered everywhere in large groups and not only has the internet survived-it has become the centre of our existence and seems to be the only reason why we still have an existence at all. Blogging has all but replaced traditional media. To me, that sounds like as much of a nightmare as a Zombie apocalypse, but the author spins it so you feel comforted by the blogging frenzy. The people are the path to the truth and those who are most reliable are public figures with heavy influence. Think Perez Hilton famous-that's what these guys are aspiring to. I love the characters. The heroine and hero are a brother/sister powerhouse, who have been raised by a husband/wife powerhouse and are trying to get both out from under their parent's thumbs, and out of their parents shots. 'George' Georgia Mason and her brother Sean are incredibly down to earth and likeable and they don't 'go up the stairs' in the horror movie sense, so you don't spend the entire book cringing while they take incredibly unnecessary risks. For the most part, Georgia is the narrator for this book in first person perspective, but there are excerpts from the blogs of Sean, their tech whiz Buffy (Love the full name) and another later recruit, Rick, to give additional insight. I won't get into the other characters because I cannot do so without spoilers but let's say, the author makes it difficult to truly get attached to anyone in this book because everyone seems to have a slightly corrupt or cardboard streak. But I love the head of security dude Steve. Feed has a great vibe. If you are a blogger, you are going to love this. I learned a lot of stuff about how these networks work and the reflection cast by the media rings very true and will probably make you want to switch off the news for a few days. There's no romance-which is a bit sad because I kept waiting for it and seeing twists where there were none-until the end and you see a 'Oh crap' moment coming and it was not something I anticipated so I am both pissed at, and impressed by, the writer for having the guts to go for it. This was an engrossing, hard-to-put-down and by all means, prolific and brilliantly written story, for sure. I will read the rest of the trilogy but it could have stood alone or even, have been separated into two different instalments for how the mood of the story shifted, but I digress. This is a high 4-like a 4.8. The only issue I had with Feed is that it had a slight tendency to repeat certain processes undertaken by the characters in too much detail, too often. Like with the logging into networks and blood-testing...I knew where they were going with it but some chapters could definitely have been whittled down a lot. And though the author made a point about computers being our saviour, the protagonists of this book are already fairly zombie-like thanks to their reliance on being logged in. Don't know if it was on purpose but I giggled a few times.